There’s not a lot to like about climate change. But if you’re looking to make lemonade from lemons, maybe a culinary climate-change corollary is the increasing abundance of al fresco dining venues in Salt Lake City. When it’s hot hot hot, this town has patios, courtyards and sidewalk tables in spades. I probably don’t have to mention the well-known al fresco award winners like La Caille, Log Haven, Tuscany and Ruth’s Diner, so here are a few of my lesser-known outdoor dining favorites. 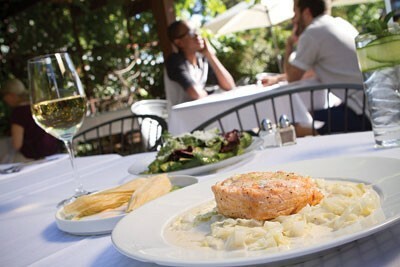 The sunny, walled-in patio at Cafe Madrid (5244 S. Highland Drive, 801-273-0837, CafeMadrid.net) offers solace, serenity and the sublime flavors of Chef Franck Peissel’s spot-on cooking. The French-born Peissel has breathed new life into the Spanish cuisine at Cafe Madrid since he took over the kitchen, and even classics like paella, tortilla Española, croquetas and the bruschetta-style sardine fillets on toast with manchego seem reinvigorated. And in case you hadn’t heard, Cafe Gaudi at Cafe Madrid serves lunch, specializing in Spanish sandwiches called bocadillos. You might not suspect that the diminutive Eva (317 S. Main, 801-359-8447, EvaSLC.com) offers patio dining, but it does. There’s a semi-secret enclosed patio out back with twinkling lights strung overhead—an urban al fresco oasis. I’m a fan of owner/chef Charlie Perry’s less-is-more style of cooking. The flavors at Eva are complex, but never convoluted, from his wood-fired flatbreads and Parmesan-rosemary-garlic french fries, to the grilled lamb T-bone and luscious lobster ravioli. Whether you drop in for breakfast, lunch, brunch or dinner, the peaceful, flower-festooned patio at Oasis Cafe (151 S. 500 East, 801-322-0404, OasisCafeSLC.com) feels like a well-earned escape from the city. Chef Efren Nicholas’ cuisine is thoughtful but not overwrought, with can’t-miss indulgences like his wild mushroom duxelles & sausage canapé with Boursin cheese and truffle butter. And, who could resist butter-poached King crab with asparagus risotto and sweet-pea emulsion sauce on a sunny day? Just a stone’s throw from the Utah Capitol, the patio at Em’s Restaurant (271 N. Center St., 801-596-0566, EmsRestaurant.com) in the Marmalade neighborhood is a hidden gem, offering marvelous views, grapevines and other plants, and chef/owner Emily Gassmann’s farm-to-table cuisine. I’d throw a tantrum if Emily ever took her chÃ¨vre-stuffed tamales with chipotle con crema off the menu, and the wild salmon roulade stuffed with leeks on creamy cabbage is another Em’s must-have. The sunny disposition of the servers matches the sunny appeal of Em’s patio. You’ll feel like you’re in San Francisco or Paris while supping at a Copper Common (111 E. 300 South, 801-355-0543) sidewalk table. The new downtown hotspot offers craft cocktails, a terrific beer, wine and liquor selection, and food ranging from bar bites like deviled eggs and housemade pickles to tuna tartare and lobster roll-style creamy crab on buttery brioche. While dining outside at Copper Common, what could be more enticing than one of the innovative chocolate or cheese and liqueur/spirits parings such as Guido Gambino Italian hazelnut chocolate and Ron Zacapa 23-year Guatemalan Solera rum? 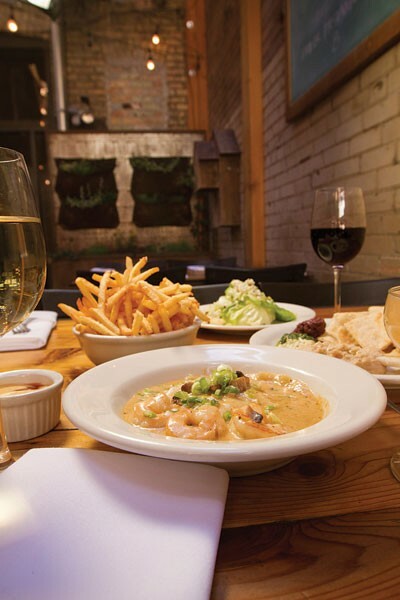 Whether you come for brunch, lunch or dinner, the pretty patio at Faustina (454 E. 300 South, 801-746-4441, FaustinaSLC.com) beckons with its Japanese maple trees, bonsai bushes, hanging flowerpots, lime-colored umbrellas and colorful peonies. The high patio walls and planter boxes create a comfortable, secluded feel in which to enjoy Chef Joe Kemp’s creative cookery. Kemp excels in the seafood department, as evidenced by his flawless crab cakes and the seared sea scallops with buerre blanc and microgreens atop lump blue crab meat. And during brunch, there’s the added incentive of $3 mimosas in an assortment of flavors including peach, pineapple, grapefruit and orange. The sidewalk seating at Vinto (418 E. 200 South, 801-539-9999, Vinto.com) is the perfect spot to indulge in some of Utah’s best wood-fired pizza and pastas, including gluten-free options. It’s here you’ll find not-too-typical pizza like the patate, with sliced Yukon Gold potatoes, fontina and goat cheese, rosemary, arugula and white truffle oil. Vinto also makes the best Italian meatballs in town, oven-roasted and served with grilled Tuscan bread. Top off your sidewalk session with natural, housemade gelato or sorbetto. To me, the most inviting al fresco dining experience in town is to be found at Fresco Italian Cafe (1513 S. 1500 East, 801-486-1300, FrescoItalianCafe.com), where the secluded courtyard is the perfect setting to enjoy Chef Logen Crew’s marvelous modernist take on Italian cuisine. Dishes like chickpea fettuccine with Gulf prawns and crab; goat-cheese agnolotti; and bucatini with smoked eggplant, fresh mozzarella, basil, breadcrumbs and pickled Fresno chiles are sure to delight. The excellent wine list doesn’t disappoint, either. For a hip and artsy vibe, I recommend the patio at Pallet (237 S. 400 West, 801-935-4431, EatPallet.com), where plenty of shade trees help you chill out in the hot sun. Enjoy a glass of Adami Prosecco or one of Pallet’s excellent house cocktails alongside a plate of oysters with mignonette; coconut-curried mussels; short rib ravioli; or the awesome truffle fries with parmesan and aioli. Don’t be surprised if there’s a bit of a wait for an outside table at The Park Café (604 E. 1300 South, 801-487-1670, TheParkCafeSLC.com). This Liberty Park eatery is as popular as they come, with great ambiance and great food to match. It’s been feeding happy customers breakfast and lunch since 1984 with menu items like Michigan hash, housemade chili, biscuits & gravy, burgers, sandwiches, salads, omelets and more. Be sure to try the banana pancakes; they’re the size of my head. One of Salt Lake City’s newest spots to sup in the sun is Luna Blanca Taqueria (3158 E. 6200 South, 801-944-5862, LunaBlancaTaco.com). Grab a cold cerveza or tequila cocktail and enjoy Luna Blanca’s south-of-the-border fare at one of its umbrella-shaded outdoor tables. Taco options include carnitas (my favorite), fish or shrimp, chicken, carne asada, grilled Portobello and the taco of the day. Round out your day in the sun with a housemade popsicle.